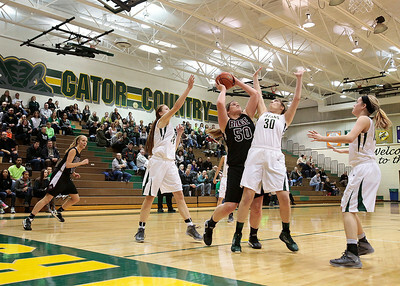 Kyle Grillot - kgrillot@shawmedia.com Prairie Ridge sophomore Kirsten Voel-Pel puts up a shot under pressure from Boylan junior Halle Stull (34) and senior Casey Pettit during the fourth quarter of the girls class 4a sectional Tuesday in Crystal Lake. Boylan Catholic beat Prairie Ridge, 64-57. Kyle Grillot - kgrillot@shawmedia.com Prairie Ridge senior Sarah Le Beau dives to save the ball from going out of bounds during the first quarter of the girls class 4a sectional Tuesday in Crystal Lake. 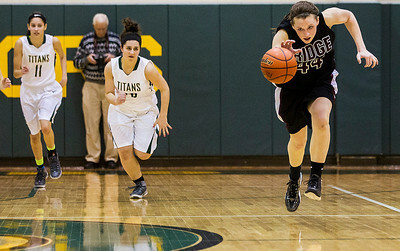 Boylan Catholic beat Prairie Ridge, 64-57. Kyle Grillot - kgrillot@shawmedia.com Prairie Ridge senior Sarah Le Beau dribbles towards the net under pressure from Boylan junior Allie Zimmerman during the fourth quarter of the girls class 4a sectional Tuesday in Crystal Lake. Boylan Catholic beat Prairie Ridge, 64-57. 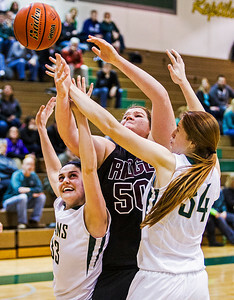 Kyle Grillot - kgrillot@shawmedia.com Prairie Ridge senior Maddie Drain (50) and Boyan juniors Emily Crouch (33) and Halle Stull fight for a rebound during the third quarter of the girls class 4a sectional Tuesday in Crystal Lake. Boylan Catholic beat Prairie Ridge, 64-57. 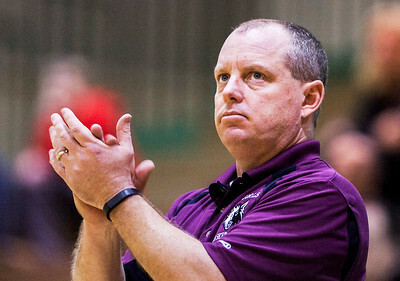 Kyle Grillot - kgrillot@shawmedia.com Prairie Ridge head coach Rob Baker cheers on his team during the fourth quarter of the girls class 4a sectional Tuesday in Crystal Lake. Boylan Catholic beat Prairie Ridge, 64-57. Kyle Grillot - kgrillot@shawmedia.com The Prairie Ridge team including senior Sarah Kilhoffer (14) and Aly Clark (22) walk off the court after the final play of the fourth quarter of the girls class 4a sectional Tuesday in Crystal Lake. Boylan Catholic beat Prairie Ridge, 64-57. Kyle Grillot - kgrillot@shawmedia.com Prairie Ridge senior Sarah Le Beau (2) puts up a shot under pressure from Boylan senior Casey Pettit during the fourth quarter of the girls class 4a sectional Tuesday in Crystal Lake. Boylan Catholic beat Prairie Ridge, 64-57. 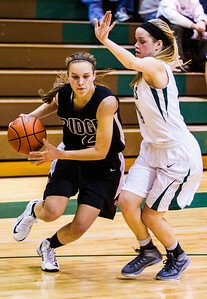 Kyle Grillot - kgrillot@shawmedia.com Prairie Ridge sophomore Kirsten Voel-Pel (44) dribbles towards the net during the fourth quarter of the girls class 4a sectional Tuesday in Crystal Lake. Boylan Catholic beat Prairie Ridge, 64-57. 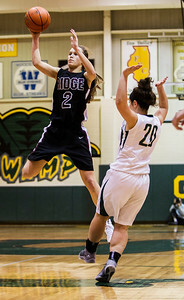 Kyle Grillot - kgrillot@shawmedia.com Prairie Ridge senior Sarah Kilhoffer (right) puts up a shot during the second quarter of the girls class 4a sectional Tuesday in Crystal Lake. Boylan Catholic beat Prairie Ridge, 64-57. 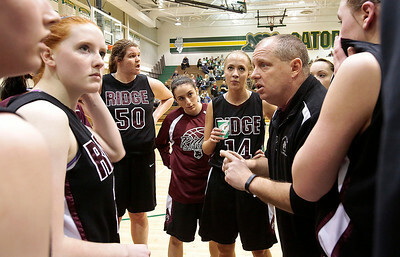 Kyle Grillot - kgrillot@shawmedia.com Prairie Ridge head coach Rob Baker talks with his team during the fourth quarter of the girls class 4a sectional Tuesday in Crystal Lake. Boylan Catholic beat Prairie Ridge, 64-57. 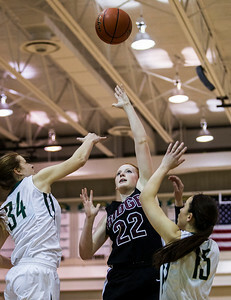 Kyle Grillot - kgrillot@shawmedia.com Prairie Ridge sophomore Aly Clark (22) puts up a shot under pressure from Boylan junior Halle Stull (34) and senior Jensen Blassage during the first quarter of the girls class 4a sectional Tuesday in Crystal Lake. Boylan Catholic beat Prairie Ridge, 64-57. 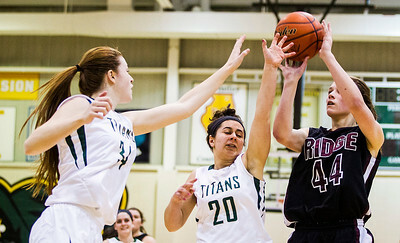 Kyle Grillot - kgrillot@shawmedia.com Prairie Ridge senior Maddie Drain puts up a shot under pressure from Boylan senior Jane Horvat (30) during the second quarter of the girls class 4a sectional Tuesday in Crystal Lake. Boylan Catholic beat Prairie Ridge, 64-57. Kyle Grillot - kgrillot@shawmedia.com Boylan junior Kayla Steward (left) knocks the ball away from Prairie Ridge junior Kelly Klndworth as she dribbles towards the net during the second quarter of the girls class 4a sectional Tuesday in Crystal Lake. Boylan Catholic beat Prairie Ridge, 64-57. Prairie Ridge sophomore Kirsten Voel-Pel (44) dribbles towards the net during the fourth quarter of the girls class 4a sectional Tuesday in Crystal Lake. Boylan Catholic beat Prairie Ridge, 64-57.